Goodreads Summary: Magic is dangerous--but love is more dangerous still. I will admit that I've only read the first Mortal Instruments book, though I fully intend to read the rest of them at some point. Even so, I enjoyed being back in the Shadowhunter world almost as much as I enjoyed the new story. If you've read other reviews of mine, this will come as no surprise: I love books set in foreign cities. I've only spent a few days in London and I would love to go back, so I was thrilled to get to do this vicariously through Tessa. I also loved the poetry quotations at the beginning of each chapter. They really helped to set the mood as well as giving me some things to think about. In addition to this, there were literature references sprinkled throughout - as a fan of the classics, I really liked this inclusion. But now for the story and characters themselves. Clockwork Angel is like a roller coaster: full of ups and downs, twists and turns, full of action and over far too soon. Tessa's strength and intelligence made her a great character. And then there are Jem and Will...even though Will made me laugh and I enjoyed his bad-boy attitude, I have to say that I had a soft spot for Jem and his quiet but dedicated nature. The story around the characters was completely engrossing and kept me searching for answers right along with Tessa and the Shadowhunters. 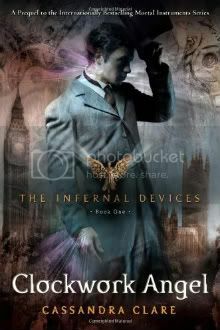 As someone who hasn't read all of Mortal Instruments, I appreciated that I could pick up Clockwork Angel and still follow everything. The world is rebuilt (though not so much as to be redundant for people who have read TMI) and I got to have the joy of discovering a new world all over again with Tessa. There were a couple of characters that I was disappointed in because of their actions...but as for which ones, you'll have to read and see for yourselves. I am dying to see what else is in store for everyone involved and to learn even more about these characters. Thank goodness there isn't long to wait before Clockwork Prince! I've only read the first TMI book as well and I keep seeing great reviews of this one around. Not sure how I feel about another YA love triangle but steampunk is a bit of a fav of mine so I'll have to check it out. This was one of my favorite reads of 2011. I really enjoyed the friendship between Jem and Will. Also, Magnus Bane is one of my absolute favorites.I am super excited that Clockwork Prince comes out tomorrow. I thought I was the only person who hadn't read this book, so I'm glad to see it took you a while to get to it too :) I haven't read any of Cassandra Clare's books yet, but it's my goal for the Christmas break. Thanks for the review!